Japanese style tea house at The Irish National Stud, Tully, Kildare, Ireland. A tea house or tearoom is a venue designed for people to gather for the purpose of drinking tea, often combined with other activities. Their function varies widely depending on the culture. As teas of different kinds became popular throughout the world through the centuries, they became not just drinks to accompany meals in homes or restaurants, but a tea culture emerged which included venues designed specifically around the serving and drinking of tea. The form of a tea house or room varies considerably, just as the occasions upon which tea is served vary both within and across cultures. From the simple tea and snack at home or as a break from work or shopping, to the relaxed social gatherings of women, to meetings where business or politics may be agreed upon, to the formal tea ceremony in Japan, the serving of tea has a multitude of purposes and styles that span so many aspects of life. Human creativity has used the various occasions in which tea is served and consumed to construct buildings appropriate to each of these occasions, buildings which reflect the physical, social, and spiritual elements that are involved in the activities. Tea houses developed around the world as the drinking of tea became popular. Business has been conducted while sharing tea together, formal rituals and ceremonies have developed surrounding tea drinking, and it has long been socially acceptable for women to gather unaccompanied by their husbands or chaperones when the purpose revolves around drinking tea. In China, during the fourth and fifth centuries tea plantations flourished and tea became a pleasurable beverage rather than a medicinal tonic. Its drinking became a social event with complex rituals and ceremonies. During the Song Dynasty (960-1279 C.E.) 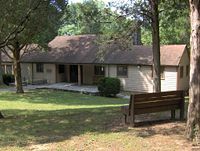 the tea house became a focus of social life, a place where business could be conducted, entertainment by professional storytellers, jugglers, poets, and actors could be enjoyed, and friends and families could relax and have casual conversation (Pettigrew and Richardson 2008). In Japan, the tea ceremony, perfected and popularized by Sen no Rikyu in the sixteenth century, required the use of a special tea house or tearoom. These were often built in traditional manner and surrounded by beautiful, peaceful gardens. In this way the Japanese elevated the Chinese ritual into a form of beauty and art, during which they sought to "remove themselves from the details of daily life and experience a pure and untainted sagelike experience of otherworldly peace" (Heiss and Heiss 2007). Since 1638, when the Mongolian ruler Altyn Khan ("Golden Khan") gave a gift of tea to the Russian Czar, Mikhail I Fyodorovich Romanov, tea has had a rich and varied history in Russia (Heiss and Heiss 2007). It became one of the most popular beverages in the country and is closely associated with traditional Russian culture. The ubiquitous Russian tea brewing device, known as a samovar, has become a symbol of hospitality and comfort. Tea is a family event, and is usually served after each meal with sugar and lemon (but without milk), and an assortment of jams, pastries, and confections. Special tearooms, however, did not develop; rather the samovar was to be found in banquet rooms, restaurants, and in the home. The well-known Russian Tea Room of New York City, opened in 1927 by Russian expatriates, is a restaurant serving a full menu of meals, not just a tea house. 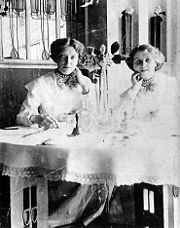 Miss Cranston's waitresses, seen in the Room de Luxe of the Willow Tea Rooms. In eighteenth century Britain, tea drinking had become a popular aspect of the gardens in London, but the expansion of buildings reduced the available space for such activities. Tearooms began to appear in Glasgow, pioneered by Catherine Cranston, and then in London when the Aerated Bread Company began to serve cups of tea at its establishments. In the cities other companies quickly opened tearooms, and in rural areas farmers' wives began serving tea and baked goods to travelers (Pettigrew and Richardson 2008). In the early twentieth century after the close of the Victorian era, stylish living became popular, and fine hotels served tea in the afternoon accompanied by music and dancing. Such activities diminished with the two World Wars, and coffeehouses and cafes became more popular. The introduction of American fast food restaurants completed the demise of the tea room. In the United States in the twentieth century, Prohibition, the automobile, and the rising independence of women led to the opening of tearooms around the country. They were as varied in style as the women who ran them. Artists and entrepreneurs set up bohemian gathering places for their friends and colleagues; stylish, elegant establishments were popular with the wealthy; others invoked cultural or literary themes to create an environment and menu attractive to tourists and locals alike. When the fast food restaurant appeared, however, tea bags, mass produced food, and their standardized environments replaced the charm and individuality of the tearoom. In Asia the tea house never lost its appeal. China boasts the best tea houses in the world, and the city of Chengdu boasts the best tea houses in China, numbering over a thousand such establishments (Gautier 2006). In Japan in the latter part of the twentieth century, Western influence led to the rising popularity of black tea. The result was the opening of British-style tearooms in which tea is served accompanied by sandwiches and scones. In Europe and the United States, tea houses and tearooms had lost popularity at that time. However, toward the end of the twentieth century a resurgence of interest in good quality tea accompanied by appetizing baked goods served in a comfortable environment led to the revival of the tearoom and tea house in Britain (Pettigrew and Richardson 2008). Tearooms have emerged in the twenty-first century as popular establishments throughout Europe, with elegant tea salons in France and British-style afternoon tea served in the finest hotels in Moscow. In the United States, interest in Asian culture brought renewed interest in varieties of teas and ways to enjoy drinking them. The purported health benefits of tea also fueled interest in new styles of tearoom which offered healthy drinks in a less stressful environment. Tea originated in Asia, as did many forms of tea house. In India and Sri Lanka, the world's largest producers of tea, however, tea is available everywhere and there is no specific tradition or ceremony accompanying it. The best cups of tea are to be found from samovars in small booths on the street (Gautier 2006). In China, a tea house (茶馆, cháguăn or 茶屋, cháwū) is traditionally quite similar to the American "cafe," albeit centered around tea rather than coffee. People gather at tea houses to chat, socialize, and enjoy tea. In Northern Imperial China teahouses were regarded as retreats for gentlemen and later for businessmen. Deals would be discussed and sealed in the neutral, relaxed surroundings of a teahouse rather than in offices. Some tea houses in Hong Kong still uphold such a tradition and are frequented by industrialists and entrepreneurs. 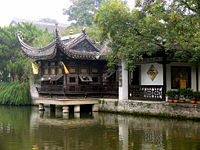 Tea houses are also places where disputes could be settled harmoniously over tea. The Chinese often replaced courts of law with a tea house and the presence of a mutually respected arbiter. The disputing parties would agree on terms and apologies, pay for the tea, shake hands, and part in peace. The Guangdong (Cantonese) style tea houses (茶楼, chálou) not only serve tea, but also dim sum (点心) food. Yum cha (飲茶) is a Cantonese term which means "drink tea" but also refers to the custom of eating small servings of different foods, known as dim sum. It is traditional to yum cha on weekend mornings, and whole families gather to chat and eat dim sum and drink Chinese tea. In the past, people went to a tea house to yum cha, but Dim sum restaurants have gained overwhelming popularity. However, the Guangdong style tea house serving dim sum and tea has become popular in other countries, particularly in major cities such as San Francisco and New York City in the United States. In Japan, there are two traditional types of tea house. Rooms where tea ceremonies (cha-no-yu) are performed are known as chashitsu (茶室, literally "tea room"). The ochaya (お茶屋 tea house) traditionally refers to a place of entertainment. 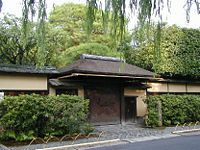 There are two types of chashitsu: free-standing structures often containing several rooms (known as tea houses in English), and rooms located within dwellings or other buildings and set aside for tea ceremony (known in English as tea rooms). Tea rooms are usually small, and are found inside tea houses as well as in private homes, temples or shrines, schools, and other institutions. In Japanese homes, any room with a tatami floor may be used as a tea room; but the same room may also be used for other purposes. The design of free-standing tea houses is heavily influenced by Zen philosophy. Tea houses were first introduced in the Sengoku period, from the middle of the fifteenth century to the beginning of the seventeenth century. They were built mostly by Zen monks or by daimyo, samurai, and merchants who practiced the tea ceremony. They sought simplicity and tranquility—central tenets of Zen philosophy. 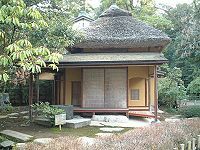 A typical tea house is surrounded by a small garden in which there is a waiting area for guests, as well as a roji (路地), or "dewy path" leading to the tea house. The tea house itself is usually built of wood and bamboo, and the entrance is a small, square door (the nijiri-guchi) which symbolically separates the small, simple, quiet inside from the crowded, overwhelming outside world. Tea houses usually consist of two rooms: one, the mizuya, where the host prepares food and snacks and tea supplies are stored, and the other for the holding of the tea ceremony itself. The main room is typically extremely small, often 4 1/2 tatami mats (9 feet (2.7 m) by 9 feet (2.7 m)), and the ceilings are low. The first tea house built according to this configuration was shogun Ashikaga Yoshimasa's Ginkaku-ji (Temple of the Silver Pavilion) in Kyoto. This small room kept the atmosphere intimate and the host and guests closely connected throughout the ritual (Heiss and Heiss 2006). There is no furniture, except for that which is required for the preparation of tea. There will usually be a charcoal pit (炉, ro) in the center of the room for boiling water for tea. Guests and hosts sit seiza style on the floor. There is usually little decoration. There will be a tokonoma (scroll alcove) holding a scroll of calligraphy or brush painting, and perhaps a small, simple, flower arrangement called a cha-bana (茶花). All materials used are intentionally simple and rustic. All doors and windows are traditional Japanese shōji, made of thin strips of balsa wood covered in a translucent Japanese paper which allows light from outside to come into the room. The floor is built a few feet above the ground in order to keep the room dry. The acknowledgment of simplicity and plainness is a central motivation of the tea house. A notable exception is the famous golden tearoom constructed at Osaka Castle by Sen no Rikyu for Toyotomi Hideyoshi, a Sengoku period daimyo who unified Japan. This tearoom had walls, ceiling, pillars, and even tea utensils of gold (Varley and Isao 1995). Tea houses were traditionally located in remote, quiet areas, but today are more likely to be found in the gardens or grounds of larger houses, or in public or private parks. 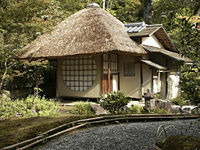 Very large tea houses, such as those that can be found in parks or those maintained by large tea schools, such as Urasenke, may have several tea rooms of different sizes; a large, well-equipped mizuya resembling a modern kitchen; a large waiting room for guests; a welcoming area where guests are greeted and can remove and store their shoes; separate toilets for men and women; a changing room; a storage room; and possibly several anterooms. Such tea houses can accommodate dozens of guests and several simultaneous tea ceremonies, and may have a total floor area exceeding 60 mats. In Japan a tea house (お茶屋, ochaya) can also refer to a place of entertainment with geisha and are typically very exclusive establishments. Ochaya are mostly wooden, traditional structures. Their windows have lattices (bengara goshi) on the ground floor and reed screens (sudare) on the first floor to protect the privacy of their clients. The origin of the modern ochaya dates back to 1712, when the Tokugawa Shogunate gave licenses to the ochaya of Gion to provide geisha entertainment. Geisha, known for their distinct make-up and attire, their elegant and graceful dance, and their demure conversation, entertain their clients with song, dance, and poetry, also offering food, drink, and conversation. The Ichiriki Ochaya (translated Ichiriki Teahouse) is one of the most famous and historic ochaya in Kyoto. 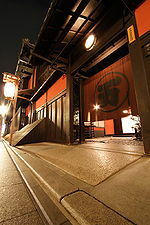 It is over 300 years old, and has been a major centerpiece of Gion since the beginning of the entertainment district. The Ichiriki has traditionally entertained those of political and business power. It is an exclusive establishment, very costly, and access is by invitation only. A tea house in Insadong, Seoul, Korea. Central to the Korean approach to tea is an easy and natural coherence, with fewer formal rituals, fewer absolutes, greater freedom for relaxation, and more creativity in enjoying a wider variety of teas, services, and conversation. The chief element of the Korean tea ceremony is the ease and naturalness of enjoying tea within an easy formal setting. This leads to a wider variance of teahouse design, tea garden entries and gardens, different use and styles of teawares, and regional variations in choice of tea, choice of cakes and snacks, seasonal and temporal variations, and the acoustic and visual ambiance of Korean teahouses. Some of the best Korean teahouses had their own small springs which provided the water for the tea. In the United Kingdom, a tearoom is a small room or restaurant where beverages and light meals are served, often catering chiefly to women and having a sedate or subdued atmosphere. A customer might expect to receive cream tea or Devonshire tea, often served from a china set, and a scone with jam and clotted cream; alternatively a high tea may be served. In Scotland teas are usually served with a variety of scones and cakes. In a related usage, a tearoom may be a room set aside in a workplace for workers to relax and take refreshment during work-breaks. Traditionally a staff member serving food and beverages in such a tearoom would have been called a tea lady. There is a long history of tearooms in London hotels, a practice which spread throughout the country and continues today. Thomas Twining opened the first known tea room in 1706, which remains at 216 Strand, London today. In 1787 the company created its logo, still in use today, which is thought to be the world's oldest commercial logo that has been in continuous use since its inception (Standage 2006). In 2006, Twinings celebrated its 300th anniversary, with a special tea, and associated tea caddies. The Room de Luxe in the Willow Tearooms as it was in 1903. The popularity of the tearoom rose as an alternative to the pub during the temperance movement. In the late 1800s Catherine Cranston opened the first of what became a chain of Miss Cranston's Tea Rooms in Glasgow, Scotland. Miss Cranston had conceived the idea of a series of "art tearooms," venues where people could meet to relax and enjoy non-alcoholic refreshments in a variety of different "rooms" within the same building. She worked together with internationally renowned architect Charles Rennie Mackintosh to design her tea rooms, which as a result made available a unique, avant-garde artistic world to thousands of ordinary people. Their tearooms became internationally famous, with descriptions stating that "Miss Cranston's tea-rooms, designed by Mr. Mackintosh, are reckoned by some of the pilgrims to Glasgow as one of the sights of the city" (Grigg 1991). The gallery in The Willow Tearooms. While other cities offered very expensive and very basic tea rooms by 1901, Miss Cranston set the standard in Glasgow for more welcoming establishments. 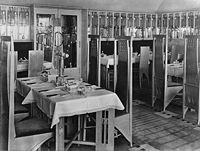 Rooms were provided for ladies only and for gentlemen only, as well as luncheon rooms where they could dine together and smoking rooms and billiard rooms for the gentlemen. Miss Cranston's Tea Rooms became social centers for all, for businessmen and apprentices, for ladies and ladies' maids. The Ladies Rooms were a particular success, allowing respectable women to go out and meet together without male company. The last and most famous of these establishments, the Willow Tearooms on Sauchiehall Street, with its famous "Room de Luxe" stretching the width of the building, opened for business in October 1903 and, following substantial renovation in the 1980s, remains open today. Following her success, similar establishments opened throughout Scotland. Well known chains of tea shops include those of Joseph Lyons and Co., which were originally opened 1894 and finally closed in 1981, and the Aerated Bread Company's tearooms. A.B.C. as it became known is mostly remembered for its chain of self-service tearooms of which the first opened in 1865. At its peak in 1923 it had 150 branch shops in London and 250 tea rooms. The Lyons tea shops were slightly more up-market, and were notable for their interior design, Oliver P. Bernard being consultant artistic director. Before the Second World War service was to the table by uniformed waitresses, known as "Nippies," but after the War the tea shops converted to cafeteria service. Until the 1940s they had a certain working-class chic, but by the 1950s and 1960s they were quick stops for busy shoppers where one could get a cup of tea and a snack or a cheap and filling meal. The tea shops always had a bakery counter at the front, and their signs, art nouveau gold lettering on white, were a familiar landmark. Bettys tea room in Harrogate, Yorkshire. 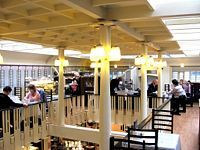 Bettys Café Tea Rooms are a smaller chain, operating exclusively in Yorkshire. They are traditional tea rooms serving traditional meals with influences both from Switzerland and Yorkshire. The first Bettys tea room was opened on Cambridge Crescent in Harrogate, North Yorkshire, by Frederick Belmont, a Swiss confectioner, in July 1919. The Harrogate tea rooms later moved to their current position on Parliament Street. Tea gardens, once popular in London before space became limited, also operate in some locations. The Orchard opened in 1897 as a tea garden in Grantchester, near Cambridge. A popular retreat for Cambridge students, teachers, and tourists, it includes many famous names among its patrons. The Orchard started when a group of Cambridge students asked the landlady, Mrs Stevenson of Orchard House, if they could take their tea in the orchard rather than on the front lawn as the custom was. This practice soon became the norm, and the place grew in popularity. The poet Rupert Brooke took up lodging in the house in 1909. A graduate student of great popularity in the university community at the time, Brooke soon attracted a great following at the place, among them Virginia Woolf, John Maynard Keynes, E. M. Forster, Bertrand Russell, Augustus John, and Ludwig Wittgenstein – the so-called Grantchester Group. Today the Orchard is open every day of the year and can be reached both by road from Cambridge or by punt down the River Cam. The Tea Room in the east section of Norris Dam State Park in Anderson County, Tennessee, in the southeastern United States. In the 1880s fine hotels in the United States began to offer tea service in tea rooms and tea courts, and by 1910 they had begun to host afternoon tea dances as dance crazes swept the country. 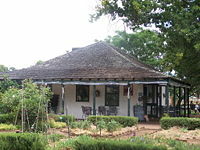 As in the United Kingdom, tea houses and tearooms also became popular in rural areas, offering refreshment to travelers. Tea houses and tea rooms in the United States today range from the whimsical Alice's Tea Cup in New York City, where patrons sit at mismatched tables and chairs or lounge on floral banquettes, to the Dushanbe Tea House in Boulder, Colorado, a gift from the sister city of Dushanbe—the capital of Tajikistan—created by over 40 artisans and featuring a hand-carved and hand-painted ceiling, tables, stools, columns, and exterior ceramic panels. A notable institution is New York's venerable Russian Tea Room, a full service restaurant opened in 1927 by former members of the Russian Imperial Ballet as a gathering place for Russian expatriates and which became famous as a gathering place for those in the entertainment industry. Although caviar has always been featured, food has always been considered second to the Russian Tea Room's décor—perpetually decked in festive red, green, and gilt with red carpet, red leather banquettes and chairs, eclectic artwork and antique samovars, and etched-glass revolving door. After being sold, renovated, closing, and sold again in the twenty-first century, the Russian Tea Room continues to be an iconic landmark of New York city (Kilian 2006). Around the world, the term "tea house" or "tea room" may be used to refer to a restaurant or Salon de Thé. In the twenty-first century they are thriving. From individual tea houses to franchises with establishments in many cities and even countries, they offer a variety of teas and atmospheres in which to enjoy them. For many, the atmosphere and experience itself is paramount, while for others the quality of the tea and its various beverages are the attraction. In others, the convenience of simple refreshments available while traveling makes a tearoom an attractive feature of tourist locations and parks. Following are some examples. Tearooms are commonly found in tourist attractions in Australia as in the United Kingdom and former colonies. For example, Tranby House, one of the oldest surviving buildings from the early settlement of the Swan River Colony in Australia, hosts a popular tearoom in one of its original buildings. Named Tranby House in 1929, in recognition of its historical significance, it was opened to the public in 1977, and continues today as a popular tourist attraction and tearoom. In the Middle East, notably in Iran and Turkey, tea houses may be referred to as Chaee-Khaneh—literally, the "house of tea." These tea houses usually serve several beverages including both tea and coffee, and some serve Hookah. 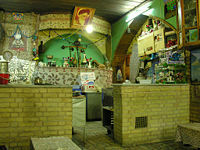 Tea houses are popular and numerous in Tajikistan. They are traditionally decorated with Persian art, lavish decoration and color, and the use of motifs from nature. They serve as social places where friends gather to talk or play chess while drinking tea. In Egypt, coffee houses are called 'ahwa' and combine serving coffee as well as tea and tisanes. Tea is called shai, and coffee is also called ahwa. Karkady, or Hibiscus tea, the infusion made from the calyces (sepals) of the Hibiscus sabdariffa flower, is also popular. A tea culture has developed in the Czech Republic, including many styles of tearooms. Different tea rooms have created various blends and methods of preparation and serving. Dobra Cajovna (also Dobrá Tea, Dobrá čajovna) is a tea house franchise originating in the city of Prague which has since opened in many other cities around the world. Dobrá (meaning "good" in Czech) specializes in serving fine loose-leaf teas brewed and served in the manner of each tea's country of origin, accompanied by pastries, couscous with fruit, spiced pita, and other snacks. There is a diverse selection of teas available, from Indian chai and Darjeeling to Chinese white tea, pu-erh, and Japanese matcha. Aside from the tea itself, Dobra's atmosphere is uniquely peaceful. Rather than promoting the "cup-on-the-run" routine that became the norm in Western cities, Dobra offers calming music and dim lighting, promoting a more relaxed experience. Less visible than in the Czech Republic, tea culture also exists in Slovakia. Although considered an underground environment by many, tea rooms have appeared in most middle-sized towns. These tea rooms are appreciated for offering quiet environments with pleasant music. More importantly, they are usually non-smoking, unlike most pubs and cafés. Kilian, Cynthia, 2006, 'Russian' Back: Famed Tea Room Set to Reopen New York Post. Retrieved Retrieved December 11, 2008. Kinchin, Perilla. 1998. Taking Tea with Mackintosh: The Story of Miss Cranston's Tea Rooms. Petulama, CA: Pomegranate Communications. ISBN 0764906925. Varley, H. Paul. 2000. Japanese Culture, 4th Edition. Honolulu: University of Hawaii Press. ISBN 0824821521. Varley, H. Paul, and Kumakura Isao. 1995. Tea in Japan: Essays on the History of Chanoyu. Honolulu, HI: University of Hawaii Press. ISBN 0824817176. All links retrieved June 5, 2014. Aerated Bread Company (ABC) National Archives (UK). Tranby House gov. of Australia. This page was last modified on 5 June 2014, at 22:00.